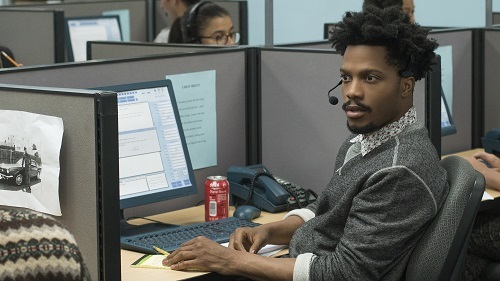 Set in a bizarre parallel-universe version of Oakland, California, Sorry to Bother You is about a young man named Cassius Green (Lakeith Stanfield from Short Term 12 and Get Out) who gets a job at a telemarketing company. After a few frustrating calls, Cassius gets some advice from an old timer named Langston (Lethal Weapon‘s Donald Glover), who tells him to use his “white voice” to boost his productivity. This works like a charm, and Cassius is soon promoted to “Power Caller” and moved upstairs to an exclusive office where he can make the big bucks. While his friends toil away downstairs in commission-based poverty-level jobs, Cassius finds more and more success in his new position, even hobnobbing with the company’s cocaine-snorting CEO, Steve Lift (Call Me By Your Name‘s Armie Hammer). Eventually, though, Cassius figures out exactly what he’s selling upstairs, and has to decide between financial security and his ability to sleep at night. 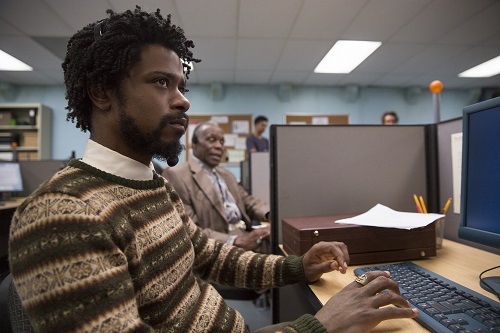 Sorry to Bother You is a pretty strange movie, and there’s not much more that can be said about it. The directorial debut of Boots Riley (frontman from the Oakland hip-hop group The Coup, who also contribute to the soundtrack), the movie starts off promisingly enough as a slightly sensationalized movie about ghetto kids trying to make their way in the world. 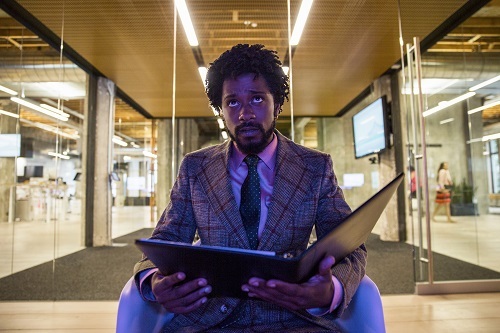 About the halfway point, though, Sorry to Bother You takes a fascinatingly dark turn, and while it’s not entirely successful at pulling off the switcheroo, it’s still kind of fun to watch it try. What begins as a subtle social commentary becomes a full-blown parody of the American economic system. There’s a lot of heavy-handed symbolism in Sorry to Bother You, most of which can’t be mentioned for fear of spoiling the strange places that the film goes in its third act. A curious sense of cultural appropriation runs rampant throughout the movie, and it comes from both sides of the fence. Of course, the African American telemarketers have greater success with their “white voices” (which are provided via voiceover by the likes of comedians Patton Oswald and David Cross). But once Cassius is rubbing elbows with Steve Lift and his cronies, the upper class seems intrigued by his “blackness.” In one scene, Lift and his pals convince Cassius to rap for them, even though he insists that he can’t. After a couple of horrendous false starts, he settles into an rhythmic two-word cadence (both of which are offensive for different reasons), and the white partygoers eat it up, singing along and dancing. It’s surreal that, to make money, Cassius has to act white, but to be accepted on a social level, his blackness is exploited. In different hands, or maybe even just handled a little differently by Riley, Sorry to Bother You could have been an important social movie along the lines of Do the Right Thing. It makes many valid political statements regarding the lower classes, the “fight for 15,” and the proliferation of glorified slave labor. Cassius’ girlfriend, Detroit (Annihilation‘s Tessa Thompson) is a street artist who also belongs to a Banksy-esque collective that uses guerilla artwork to educate the public. And one of the telemarketing callers is an activist named Squeeze (Mayhem‘s Steven Yeun) who is there for the sole purpose of unionizing the shop. So, Sorry to Bother You does have some important things to say. It just has a quirky way of saying them. There’s an underhanded attitude to the humor in Sorry to Bother You. 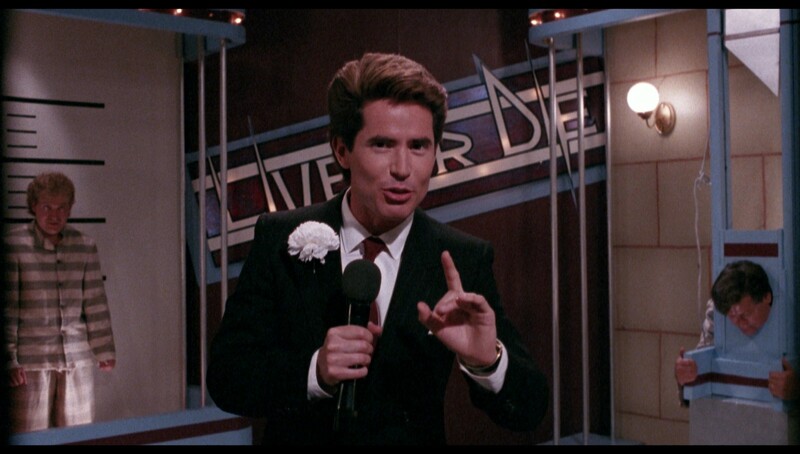 Much of it is the kind of comedy that makes the audience feel weird for finding it funny, but it is funny nonetheless. The aforementioned party scene where Cassius raps is a perfect example. He slips into a lowest-common-denominator, zero-message rap, and the white folks love it. It’s a bit stereotyping on both ends; the whites firstly believing that all blacks can rap, and then lapping up Cassius’ brainless hip hop imitation like it was the second coming of Kurtis Blow. The bit should be ashamed of itself, but it’s hysterical. Another example is the “white voices.” It’s pathetic that the characters have to resort to those means in order to sell their wares. But the obviously overdubbed voices are hilarious. The movie even makes fun of itself in this regard when Detroit uses a “British voice” (courtesy of Cinderella herself, Lily James) during one of her art shows. Most of the humor in Sorry to Bother You is like that. It’s uncomfortable, and you shouldn’t laugh, but sometimes, you just can’t help it.